Like a number of others Roland and I too went out Friday. Through the pea soup we found the fog dissipated at about 3-4 miles out and it was a beautiful clear sunny day, flat clam. We went out to a wreck south of the Nab to fish the slack. Managed the usual pout and dogs but somehow managed to lose 3 what I suspect were reasonable 20-40 lb congers. All let go of the baits, no breakages so probably striking a bit early but always eager to stop them going back into the wreck. We had each on for a couple of minutes but hey ho – put it down to incompetence. As the big spring started to pick up the fog came out and we moved back in shore to fish out at East Nab. 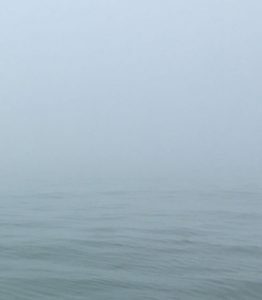 By now all we could hear all afternoon were fog horns, but glad we’d made a point of staying well out of the way of the shipping channels. More dogs, pout and now some whiting came aboard. 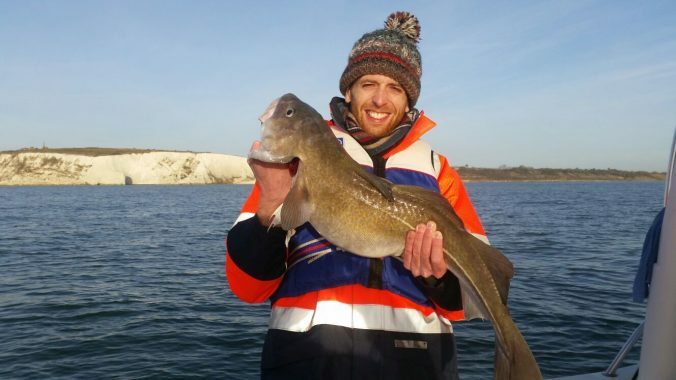 Not a great day in terms of catches but happy to hear from your report that cod are still around. …rather than a catch report. 30th December, calm they said. Calm it was, but also a pea-soup fog. I texted Garry who had gone out earlier to check conditions and he replied that it was clear past the harbour. Along with several other boats we crept out of the marina, navigated the channel pile by pile, then pointed in a southerly direction waiting for that moment when you burst into sunshine. Well we didn’t. As we got further from Langstone I realised Nab and New Grounds were going to be too far away if I was chugging along at 8 knots peering into the murk, to I reset the waypoint to Deal Tail. When I arrived there I could make out several other boats with a similar idea, so I found a space and anchored up. It was very creepy, we could hear each other but only one other boat was in sight most of the time. 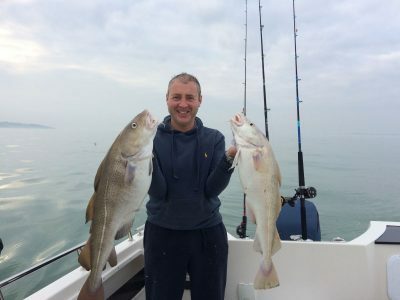 As for fish caught – it was the usual pout, whiting and dogfish this time. 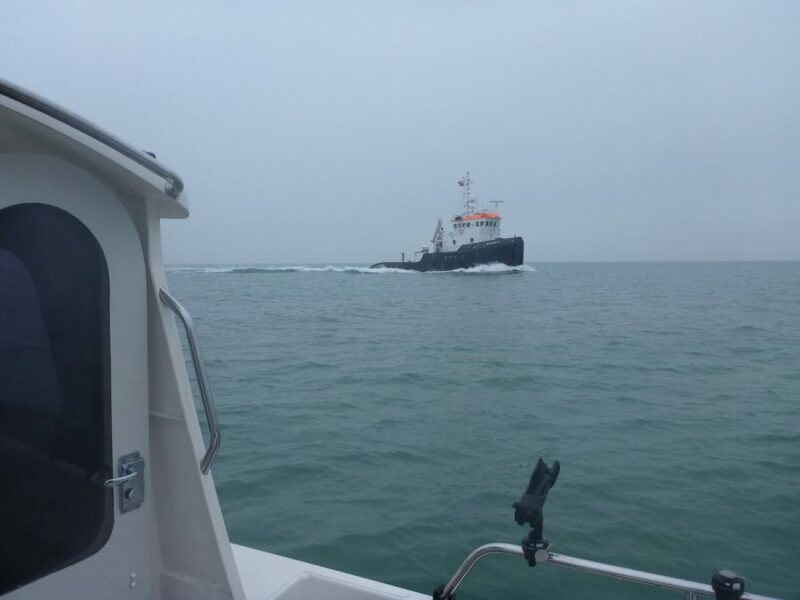 Along with several other boats I made my way back early, in case of mishap, and it was a real navigational challenge to get through the Langstone run and round Ferry Point. Visibility was about 50 metres which sounds a lot, but the Run is about 200 metres across so there was a large slice in the middle where you couldn’t see anything. I was glad to be back in my berth safely. Robert my berth neighbour cheered me up though, he had brought back a 21lb cod which proves there are cod to be caught. Well that is the last time I offer to take my son fishing when he comes to visit us! Another one of those lovely calm winter days that seem to just appear and have got to be used. We set out from Bembridge Harbour at just after 8 am and set ourselves up just off Culver. Started catching pouting straight away. 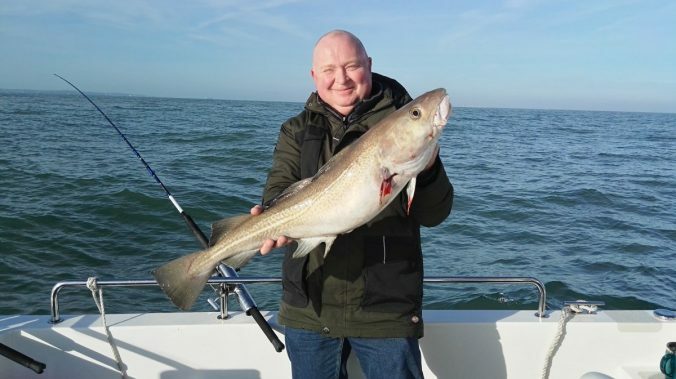 Paul often teases me that I get rather over excited asking for the landing net when it is not really necessary so when he started pulling in this 12 lb cod he had to plead with me before I would get the net into action and as you can see a good result. Fishing dropped off as the tide started running out so back home for lunch. 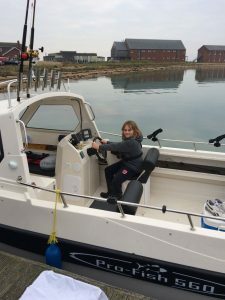 With a small weather window before storm Barbara arrives we took to the water for the Last fishing trip before Santa arrives hoping for an early Christmas present. 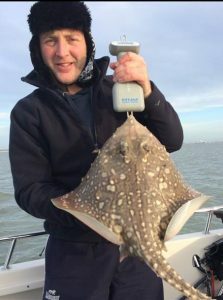 We set off nice and early and we had the anchor down by 8am the tide had just started to turn and within minutes of the bait hitting the seabed we had our first of three rays the biggest weighing in at 9 Lbs all returned to fight another day. For the next three hours we had a steady stream of whiting, pout and not to feel left out the odd dogfish or 10. Luke had been giving me the countdown to getting the bacon on as the smell of it cooking brings on the Cod, well he called it half way through cooking the rod bent over with the best bite of the day and with the tide running hard the fish put up a good fight on our 12 lbs rod but we were all smiles when we landed this 15 Lbs Cod. Let’s hope storm Barbara doesn’t stay for long and we can get out before we have to go back to work in the new year. Happy Christmas and tight lines of 2017. After hearing good reports from the Nab area we decided to try a new mark nearby. 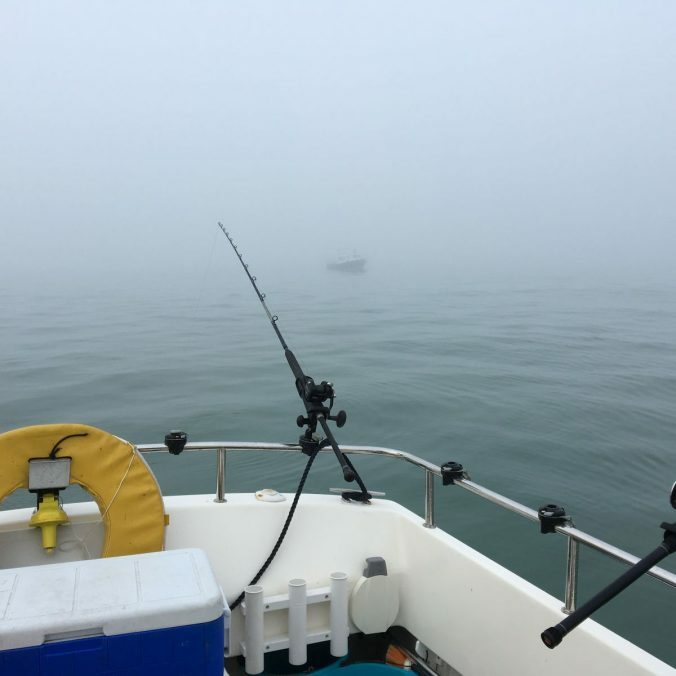 We dropped anchor around 8am and as the tide slowly turned we put some lines down, my dad had a tiny strap and a thornback, I had a small whiting. When the tide started running we had congers taking through out the whole tide but only got 2 of them to the boat because we only had 50lb mono traces. My dad used a tope trace we had in the tackle box with a pennel hooked pout. 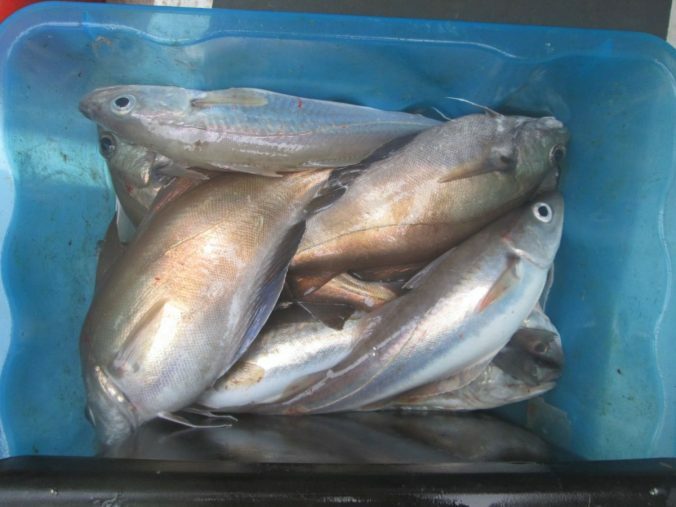 We didn’t get a cod but we had bites all day with plenty of chunky pout and channel whiting to take home. 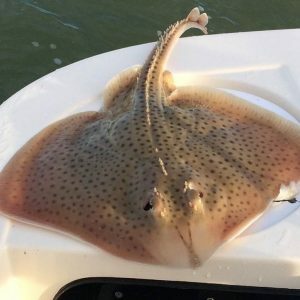 My dad had three rays, thornback, small eyed and a small blonde I think? The weather was overcast but it wasn’t too windy so a nice day to be out. Also minimal dogfish so can complain, just haven’t had a cod in 2016 . Hopefully we’ll get some in the spring. I decided to go out just north of Medmery Bank today which had about 17m depth of water at high tide. 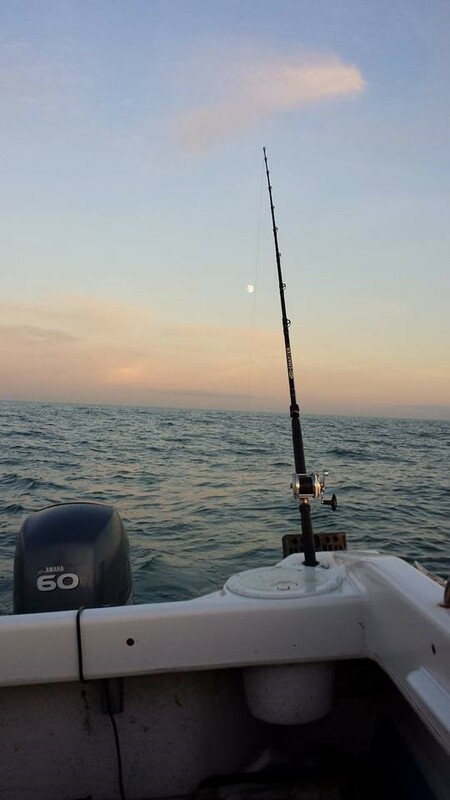 Very flat water and cruised at 23 knots there and back with hardly another boat seen all day – biggest wave about 3.5 inches…. and nice easy fishing for a change. The sea fog threatened a few times, but didn’t get too bad luckily. A few whiting, and lots of doggies and pout all day, which took anything from lug, sandeel, whole squid and even double squid! 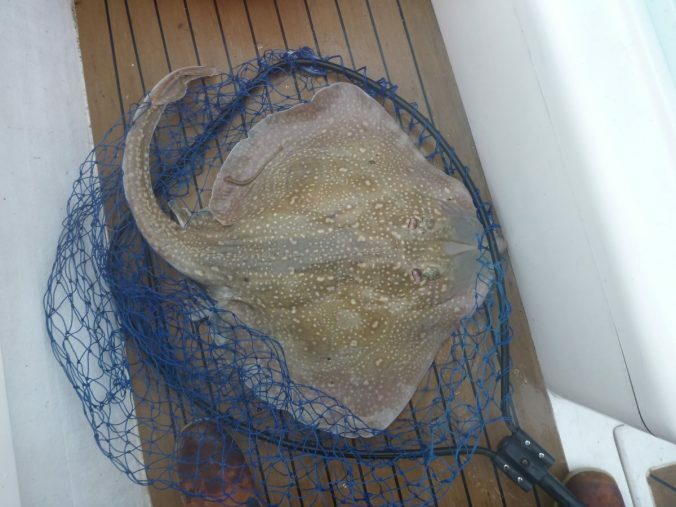 Also, caught a 11.5lb Undulate Ray on a whole mackerel flapper at slack water though, which is a new species for me. I’ll have to try a small pout or whiting as bait for cod or conger next time, but probably next year now looking at the weather forecast for next week. My son and I picked up our new admiral 560 fast fisher some weeks ago and we have been waiting very patiently for a weather window in my son’s words to get some blood on the deck. So on Saturday my good wife kindly offered the get up extra early to launch the boat. 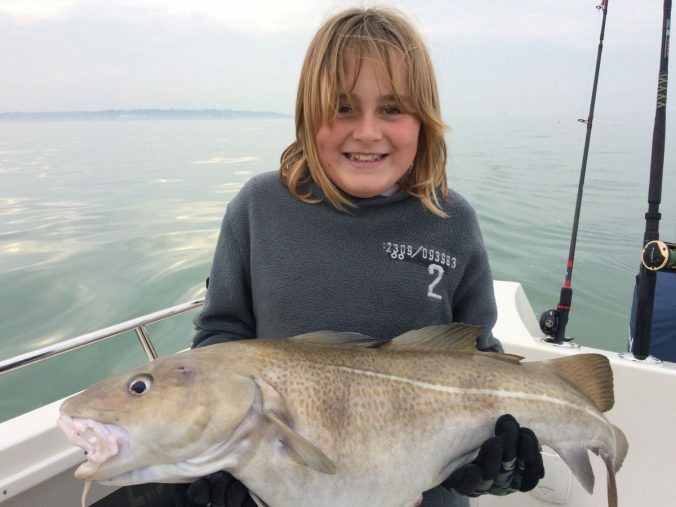 We headed straight out to our favourite cod spot and after the first hour we had the usual dogfish and some very nice pout, the boy was very happy that he had the first fish on board. 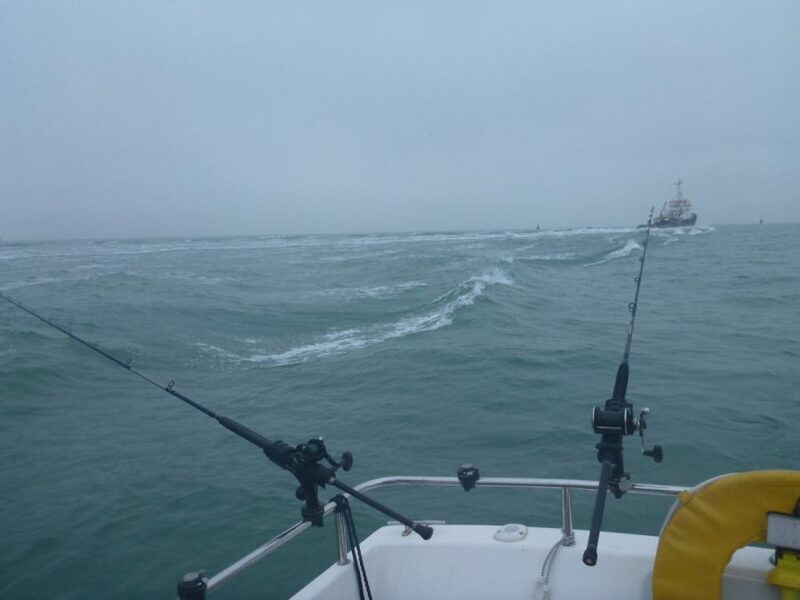 As it approached slack water the Whiting arrived with some good sport on our light rods, the boat was on the turn so out come the cooker bacon butty all round. The tide had now turned and down to our last five Squid I phoned the wife to let her know that we would be back soon, as soon as the phone went down son Luke shouts fish on and after a good fight we landed our first Cod of 12 Lbs not to be out done my rod started to nod and within 10 minutes we had our second Cod 14.5 Lbs. What a day the boat performed brilliantly the fish turned up and I had a great day out with my best friend Luke. Last weekend before Christmas – I think I was very lucky to be allowed out at all. It was a foggy, murky day and I had to juggle tides at Southsea Marina so I decided on a leisurely start, fish local and be in by dark. That went to plan and by noon I was fishing on a patch of mixed ground which had produced before. 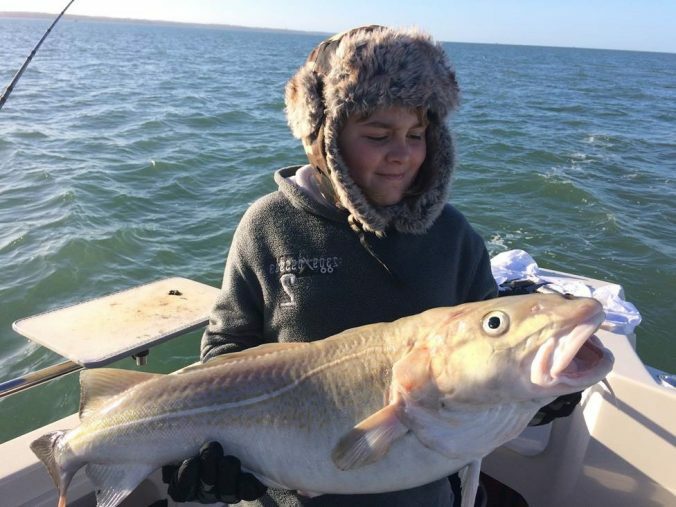 Rods were soon nodding and produced small conger, a couple of dogfish and plenty of good sized whiting and pout. 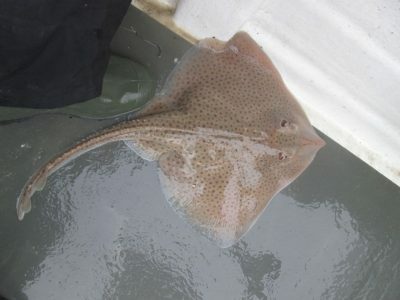 The smaller whiting went down again as bait and accounted for more conger and a blonde ray of about 15lbs. As the sun dropped the gloom closed in and I decided to call it a day – no cod but plenty of action. Action of a different sort happened as I was thinking of packing up, this tug from Rotterdam came past, close but a respectable distance, but the wash from these things is something else. Everything that wasn’t wedged in place ended up on the deck – in a smaller boat it would have been very scary. Garrydog also came by to say hello – good to meet you! Me and dad left at 4am on the Sunday morning. Down to the boat and ready to launch by 7am but the left trailer brakes had locked up! We quickly jacked up the trailer with the boat on it using the car’s jack and took apart the wheel to remove the brake. Wheel back together, we launched he boat and were out at our favorite east nab mark by around 9am. Straight into pout and dogs and my dad had a small thornback. After a few dogfish I got another bite which i struck and instantly felt a heavier fish. After a fun fight debating whether it was a cod or conger and getting excited cause I felt head shakes on my ugly stik 12-20, I brought a small strap of around 10lb to the side of the boat. 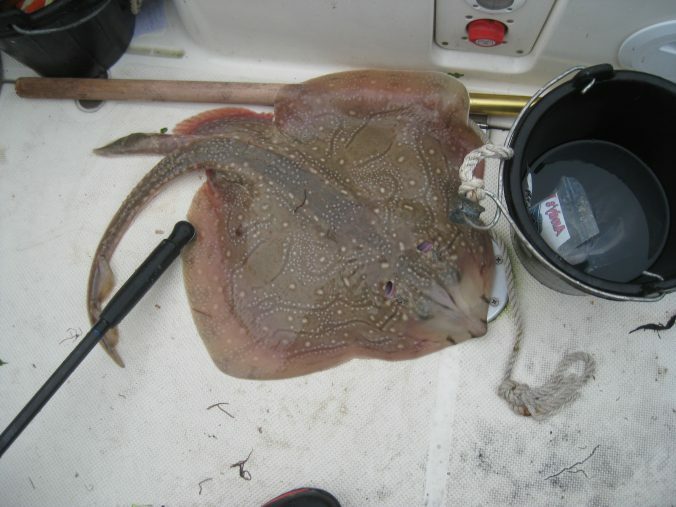 We slipped it back over the side of the boat not bringing it in, they’re smiley buggers. Kept a few big pout and whiting to make fishcakes. We moved to another mark nearby for the flood where my dad lost a fish that felt like something better. The anchor dragged twice so we headed in just as the sun set over the IOW. The weather was a bit windy in the morning with some swell from the wind through the week getting up to a force 8 at on the point apparently. We decided on a last minute trip out today with my mate Paul so we headed for a mark just north of the Nab Tower. From the off we were into some decent whiting up to around 3lb+. 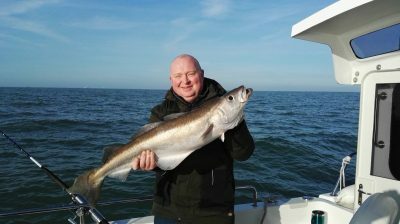 Around late morning came the first decent fish to me, a cod just under 15lb which was followed by a pollack of 15lb which took me by surprise as I’ve never seen many pollack let alone that size come up from where we were fishing. After the pollack I had a conger around the 30lb mark. 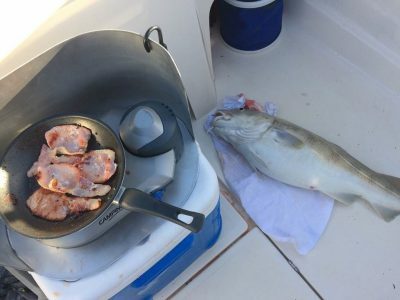 After loads more whiting my mate decided to use some small whiting as live bait and he lost a couple good fish and one had bit the whiting off right behind the head. Probably conger but we’ll never know. I lost couple good fish which felt like conger and cod. Will deffo go back to that mark again! There was a 30lb cod caught on a charter about half a mile from me today.